Get to your wedding and reception in style with San Antonio Top Limo. Our professional chauffeurs are ready to drive you to that wonderful place on the big day. We can get you there on time and in place without a problem. Take a ride to your wedding in luxury and style. No matter how many people you need to fit in the limo, we’ve got you covered. Choose from our fleet of luxurious limousines for the right pick for you. Arrive in style and get ready to have a great time at your wedding and reception. No matter what kind of limo you want to arrive in, we can make it happen. With our classic stretched sedans, SUV limos, and our black or white Hummer limos, you can choose one that suites you. With luxurious leather seats, flat screen TV’s, surround sound speaker systems, and LED lighting, these limos look amazing on the inside and outside both. Your wedding pictures will look great with one of our sleek, luxurious limousines in the background. Want to arrive and catch some eyes? Our SUV limos and Hummer limos are great for a grand first impression. And while you sit in the back, you can relax and chill before the grand moment with a cold drink and some calm music on our amazing surround sound speaker systems. Our limos are prepped and clean for every drive, so you can be assured nothing dirty will be inside our limos when you step in. Our professional chauffeur will make sure you arrive on time. And once the wedding is over, it’s time to head on over to the reception. Our chauffeur will be waiting for you and will get you to the reception location without any worries. No need to stress about driving, because you can just sit back and relax in our limo on your way. Get the VIP treatment anywhere you decide to go, and just chill. Listen to some music on our speaker system and enjoy a cold drink while we drive you to the next location. Party on your way to the reception, and then even more while you’re there. With San Antonio Top Limo, your limo experience will only be the best. With our VIP treatment and professional chauffeurs, you will be getting the first class experience that you want. We can accommodate anybody you want in our limousines, and get you to the destination in style. Don’t wait any longer. Call us and book your wedding limousine today. We will pick you up wherever you need us to and arrive on time. 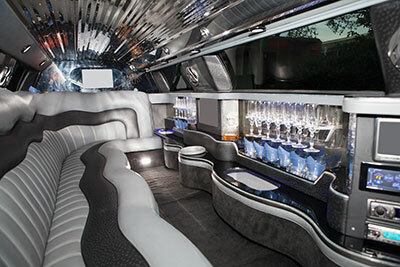 The party never has to stop while you’re in one of our amazing limousines. So if you want an unrivaled wedding and reception limo experience, call San Antonio Top Limo today!